The year 2007 started terribly well for Toyonoshima (23 years, Tokitsukaze-beya). Promoted to maegashira 9, his best ranking until then, the Haru Basho allowed him to obtain the best result (12-3) of his makuuchi career which started in Aki basho 2004. He was even the only one to delay Asashoryu's yusho until the last moment. Not until day 14 could the yokozuna secure his victory. The tournament ensured Toyonoshima his first prizes, the fighting spirit award and the technique award, and a rise to the head of maegashira for the Haru Basho, where he would achieve his kachi-koshi (8-7), offering him a promotion to komusubi for the Natsu Basho. Until this time, all went well for the future sanyaku. Alas, all was also put at risk on April 30th during a keiko session with Asashoryu. Injured on the right leg, Toyonoshima was forced to rest until the tournament, and even his participation was uncertain. 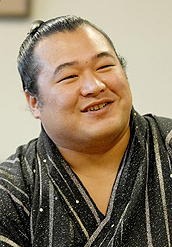 Finally, he did participate, but could not even cause a stir, finishing 4-11 at a rank where he, of course, had to fight against the best on the banzuke. Ironically enough, taking into account the circumstances, he started the basho competing against Asashoryu. After the Natsu Basho, which was marked not only by his bad luck but also by his courage, Toyonoshima returned to Kochi, his home region. This is a translation of the interview he gave to the regional daily newspaper Kochi Shimbun. After a tournament which he finished at 4-11 the new komusubi, Toyonoshima, came to Kochi Shimbun to strike a balance. For him, the Natsu Basho became a battle against the pain of his wounded right leg. 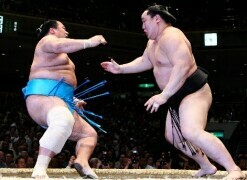 But during those fifteen days he courageously continued to practise his sumo, warmly encouraged by many fans. He returned to us from a basho where he had to face a difficult situation. Kochi Shimbun: Two weeks before the beginning of the summer tournament, the ligaments of your knee and your right ankle were wounded during keiko with Yokozuna Asashoryu. Toyonoshima: After I was thrown to the ground during training, my leg was paralyzed and I could no longer hold myself upright. But it was not as serious as I feared. 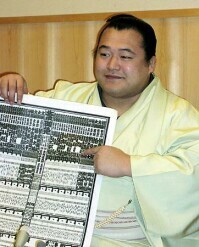 The yokozuna asked me whether I was ok, and I did not think that it was his fault. I could not lose my cool during training, and was literally sitting at the edge of my seat. During the two weeks preceding the tournament, I had to remain at rest with my heya companions. I went out for oxygen treatments, massages... I was afraid of having to participate in the tournament without being able to move. Until the last moment I was worried about my participation. But I was determined not to use my injury as an excuse if I did take part. KS: Ultimately, you had a result of 4 wins and 11 losses. Toyonoshima: As I went make-koshi, it may appear odd to say that I fought well. However, I think that during those fifteen days, I was fighting well. Until my injury, I was really going strong. In the Haru Basho, I gained eight victories and I was promoted to the top of maegashira. I thought that I would be able to achieve the same thing as a komusubi. But it's no use thinking what could have happened without this injury. KS: It was said that after your six continuous defeats, you told your family of your discouragement. Toyonoshima: I had not thought that I would lose power at that point. The third day, when Ama was at the edge of the dohyo and pushed me back with only one blow, I did not have any force anymore. The sixth day against Kotoshogiku, I was in a favorable position and my hands were placed for a morozashi, but I lost without being able to do anything. This was very difficult and I started to think that if I lost even when I had the advantage, it was embarrassing also for my adversaries. Therefore, the idea of giving up passed through my mind. KS: On the seventh day, you gained your first victory against Chiyotaikai, then, from the tenth day, you had three consecutive wins. Toyonoshima: An injury does not improve from one day to the next. It is simply the feeling which changed. Compared with the first day, the last day was easier. Of course, I was also feeling better after my first victory. My injury was painful when I moved backward, so it was necessary for me to attack. I relearned the importance of moving forward so that the pain was not too bad. KS: The fourteenth day, you were beaten by Tochiozan, your junior who is also from the Kochi area. Toyonoshima: Around me, people said that he was an adversary against whom I had to win. On the contrary, he is a makuuchi rikishi at the same ranking as me. He is my junior, but I have no intention of looking down on him. But of course, I want to win the next time and we will motivate each other. KS: You were sanyaku for one tournament and it was very bad. Toyonoshima: The important time starts now. Until the next basho I will look after my injury. My initial goal is to achieve kachi-koshi. Then, I will gradually aim to return to sanyaku and to the rank of sekiwake.